As I mentioned in my post from Monday, I’ve been working on my own latest upcycling project, a project intended to combine this with this, a modern take on upcycling tire tread into shoe soles, and at the time I’d hoped to unveil its successful completion today. The shoes you see here in the first photo are made by a company called Sanuk, and their tagline for the product line is: These are not shoes. They’re sandals! So, the only way Sanuk can make these “sandals” as lightweight as they are is to use a material for the soles that is more suited for a sandy beach or a swim club than concrete, tarmac, or even hiking trails, and sure enough I wore through mine in less than six months, while the uppers of the shoe were still in perfect condition. Having grown up in the 1960s and ’70s, I vividly recall the tire tread sandals that were worn by many a member of the counterculture of the time, and since I couldn’t stand the thought of throwing out my Sanuks, for environmental reasons and because I loved them so much, an idea was born: Replace the soles with tire tread! Now, finding a used tire to work with was the easiest part, as a local tire shop let me have one for free. Cutting the tire up, well, that’s a whole other story. Short version, for anyone not so inclined to read the rest of the story, I can sum up the reason for the failure of my first attempt in two words: steel belt. 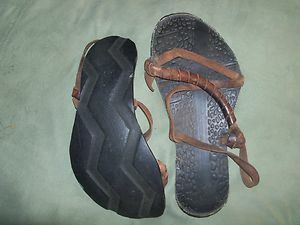 See, hippies didn’t stop making tire tread sandals because they fell out of fashion. No, they stopped because, by the mid-1970s, most car tires were steel-belted, meaning a belt of steel mesh was embedded in the rubber, resulting in a much more durable tire. 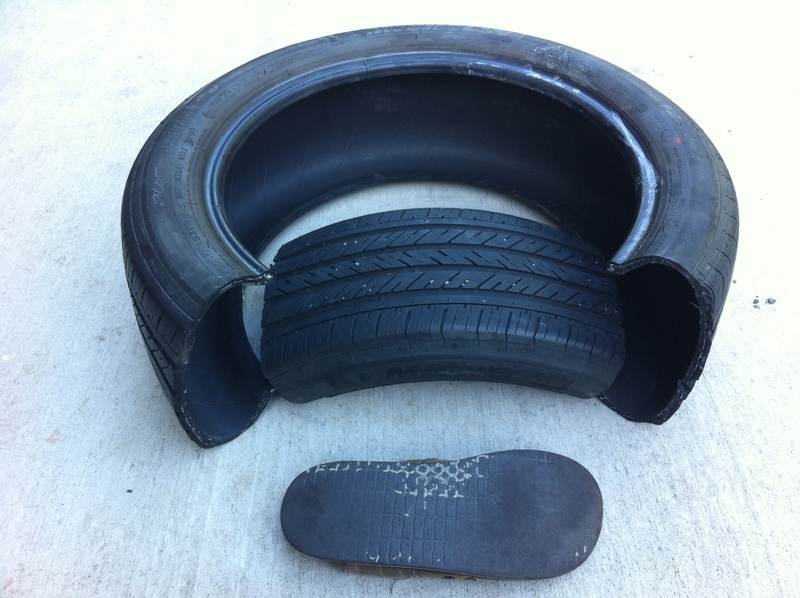 Problem is, as I came to find out, the new tire technology was an extremely poor material for making sandal soles. Brutal, and it was painfully obvious that it would take a MUCH better tool to cut out the actual shape of the sole. My first attempt, a trip to the local hardware store for metal-cutting blades for my handheld jigsaw, was a colossal waste of time. The up-down motion of the jigsaw blade made the rubber vibrate too much, and, because the jigsaw I own doesn’t have enough power, the blade easily got stuck in the rubber as it tried to make its way through. A shout out for help led me to the shop of my industrial designer friend, Tom, owner of M I N T Architectural Elements, who was generous enough to let me use his band saw. MUCH, much easier, but, sadly, the celebration was short-lived, as one problem after another arose from that point forward. 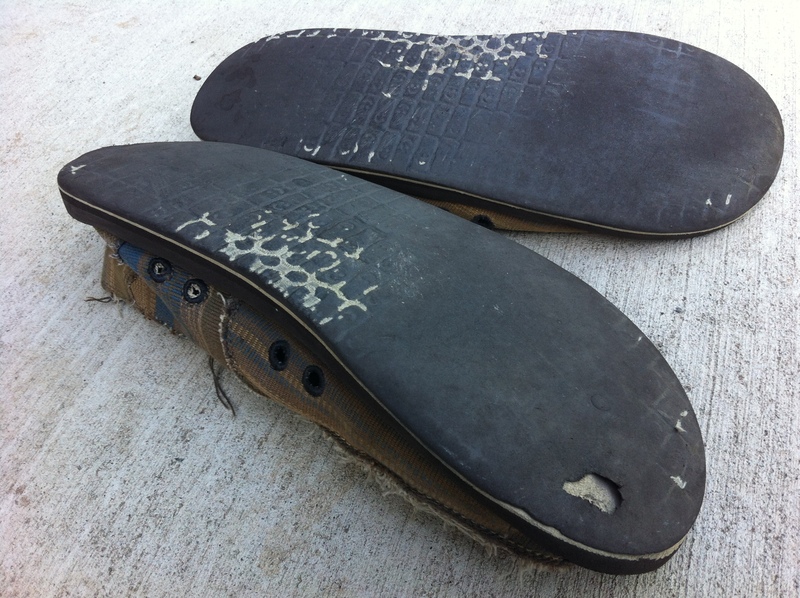 First, after cutting out the shape of the sole, there were hundreds of steel wires sticking out of the sides, making it extremely easy incur puncture wounds and scrapes just gently handling the things. …but the little wires wiggled too much and once the the grinder hit the rubber, the rubber would smoke, releasing what I can only assume was a thick, toxic plume. So, I decided to move on, figuring I’d get the soles attached and then decide later how to deal with the exposed steel mesh. 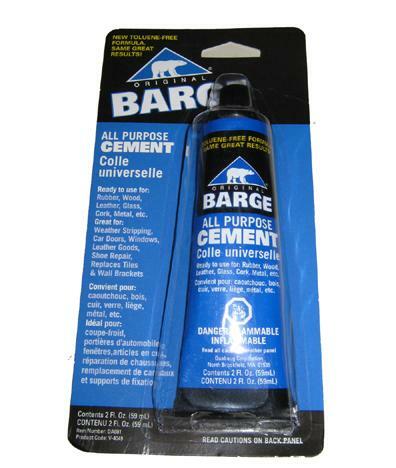 On advice from the hardware store, I bought some Barge Cement, often used for shoe sole repair, followed the instructions, clamped those suckers together, and let them dry. Once dry, the shoes were ready for a test drive, which revealed the next problem: steel-belted tire tread is heavy and rigid, the opposite of the lightweight rubber foam soles the shoes came with. As a result, with each step I took, I could feel that the tire tread was not flexing much at all, resulting in my heel, annoyingly and ultimately unacceptably, popping out of the shoe. I had the idea of cutting out some horizontal grooves in the tread, specifically where the most flex is needed, but it took an hour of work to make just one groove, and I finally had to accept that it was futile. Cuz, you see, just creating this one groove took a LOT of work, it produced a LOT of toxic smoke, and the second test drive proved that the groove, located at the most important position on the sole, directly under the ball of the foot where most of the flex happens, didn’t bring one bit of improvement. And so, the decision was made to go with a new idea: Look for a tire without a steel belt! They are hard to find, especially tires with tread as wide as these need to be, but I’m gonna give it everything I’ve got. I want these shoes badly, and I’ll not rest until they are mine! Ever consider using motorcycle tires? They’re composed of thinner layers of rubber, narrower and possibly easier to work with tools, and the tread resembles that of your beloved yet expired shoes. Hmmmm. Motorcycle tires. I’ll keep an eye out for them. Thanks! 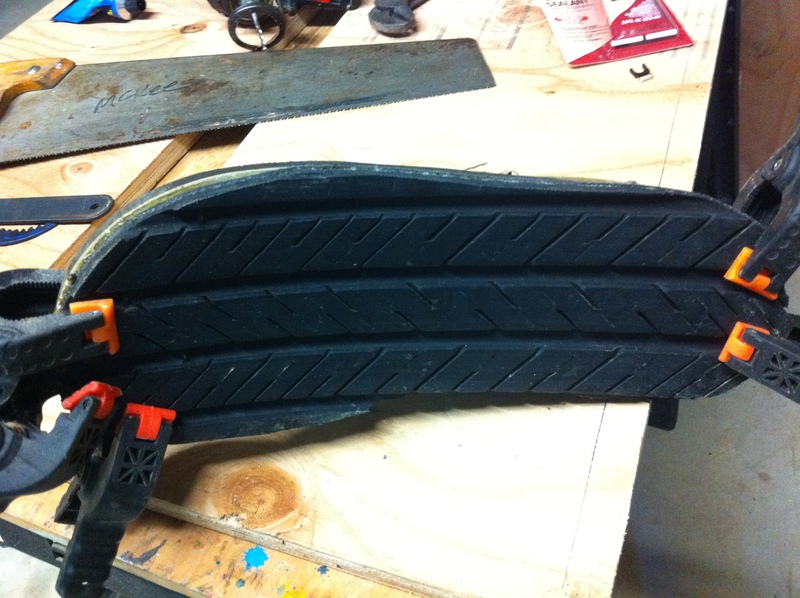 Boat trailer tire are bias, easy to cut with a jigsaw blade ( with the blade sanded on the side, a well worn blade works good). Good luck. P.s. motorcycle tires will ne radial and hard to cut. Gives new meaning to the words “tired feet” 🙂 – good luck finding more appropriate tires. OH gosh … the wink was an accident I really AM fascinated! Awesome post! And good luck trying to find non-steel-belted tires! How ’bout old motorcycle tires? They might be wide enough and may not be steel belted. Or, ATV tires or the tires on ride-on lawnmowers. Just some ideas, and I would definitely wear a pair of shoes that are made up of recycled materials! The idea rocks and I hope you figure out a way to get it done! I still have not found a tire without a steel belt! I so bummed! Oh, and yes, ventilation is a must! Hello! Thanks for responding to this old-ish post! The timing was incredible, because the same day you posted this I was cleaning up in my shop and came across these shoes, which I haven’t touched since I wrote this post. I have to admit that I got really discouraged, and I even considered throwing the shoes in the trash, but your comment has inspired me to not give up! Used mountain bike tires. That’s what I use. Thin enough to feel the ground underneath you feet AND light enough to flex. You need a light layer of rubber as a sole for a lightweight shoe/sandal. Really? Will the tread be wide enough? I’ve got big feet, size 12-U.S. Awesome idea, if they are wide enough! Try finding a truck tire re-tread shop, they sell or maybe even give you cut-offs of tread materail, it will be flat ready to cut to shape. Thanks for the tip! I’m still holding out that I can complete this project, even though I was able to score a practically brand new pair of Sanuks at a recent REI Garage Sale for only $9.00! Good luck keep with it! The world is waiting to hear about the success! Mountain bike tyres sound like the go … one thing I thought of was old farm equipment tyres, like the front wheels off an old tractor. Or an old wheelbarrow tyre. They are quite wide. Tractor tyres would have high sidewall so plenty of rubber there to use. I like ur research,but ma question is which machines are suitable for cutting the tyre & the type of glue? 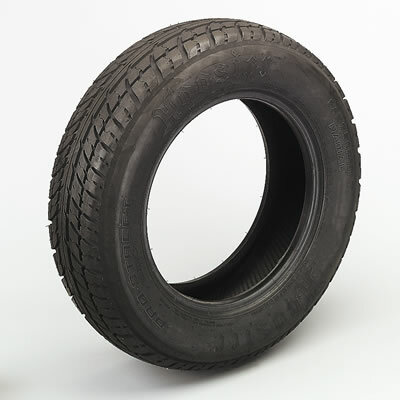 Spare donut tires that come with your car are generally banded with nylon, not steel, hence why they are so fragile compared to a traditional tire. 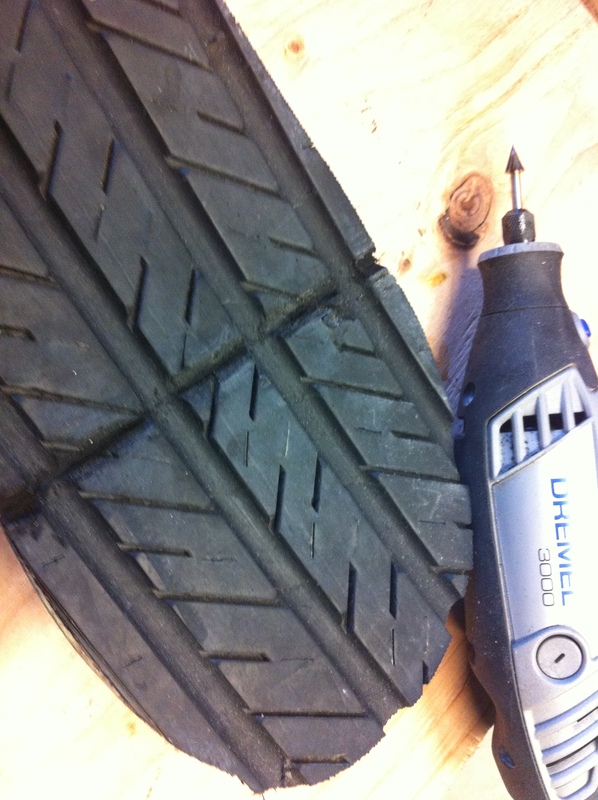 The tread will be a lil less traction than a steel banded tire, but you might be able to have “spare” on the bottoms of your shoes, maybe appropriate if you found a pair of replacements at a garage sale. Also, try cutting with a hand jigsaw outdoors. For the steel banding (if you use steel banded), buy shoe goo and smear on a heavy layer to cover the bands and prevent the dangers of scratching. I’ve also gone through 10 pairs of snails and though of retreading them. Problem is you need something light and comfortable similar to th bottoms already on them. 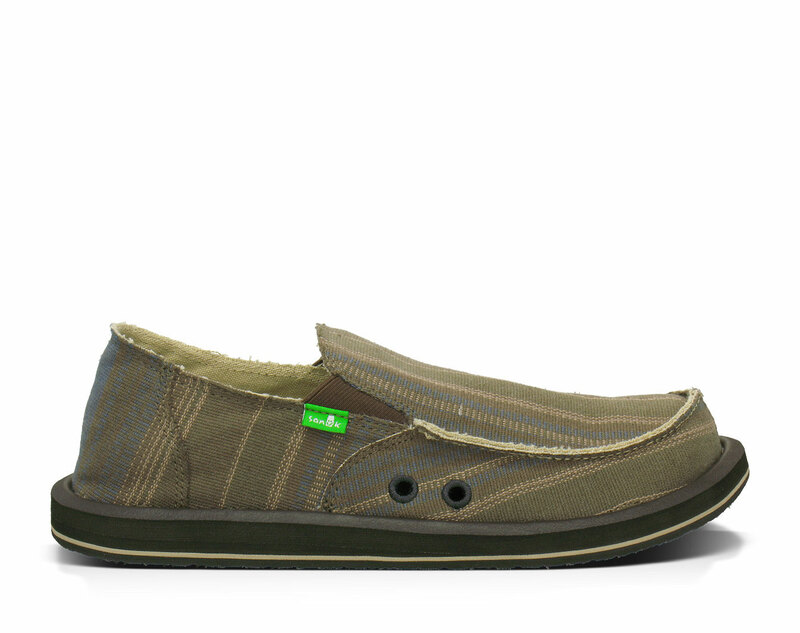 Would the Sanuk company sell us th foamy sole material? Back when I was growing up my dear old dad used to re-sole his tennis shoes with rubber he’d cut from an inner tube, using barges rubber cement as an adhesive. Don’t give up on your idea. 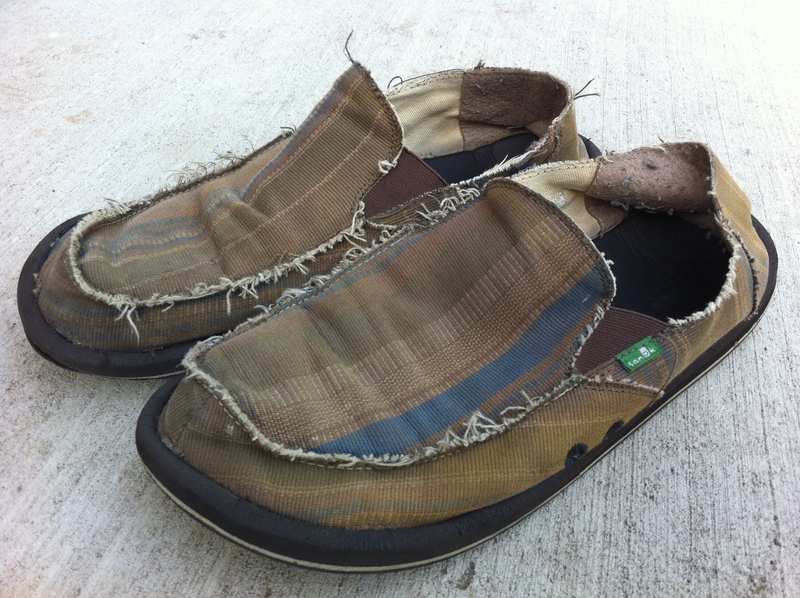 There are many of of Us out here, Sanuk users with holes in our beloved sandals. You’re doing a work of love . . .
Coming up on three years now – any luck or revelations? Sadly, I abandoned the project. I think I still have the shoes, LOL, buried somewhere in my garage, but not sure if I’ll ever make another attempt at it. This blog was several years ago but for those who still want to do this…You can try using rubber runners (used on flooring). They’re usually made of recycled rubber tires. 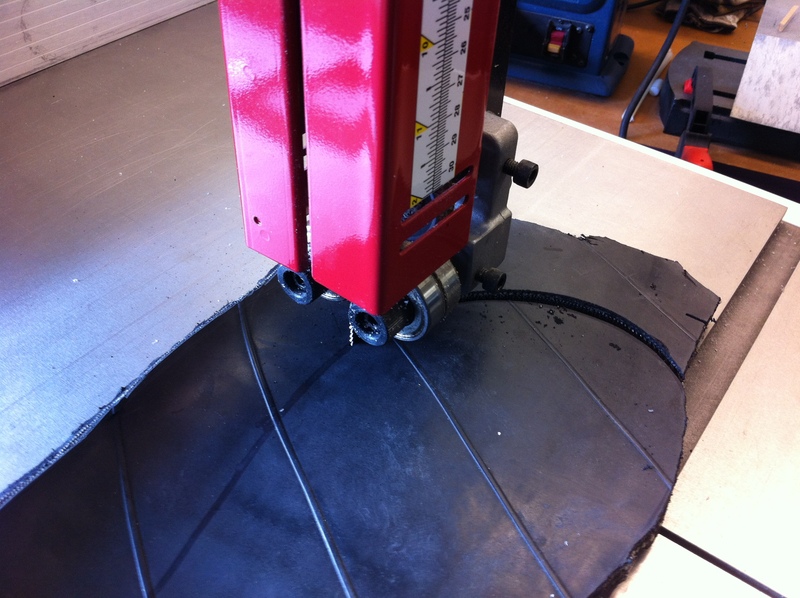 They’re flat and not as thick as rubber tires so cutting them won’t be as hard. I know this is an old thread, but racing tires and a tire groover might be your answer.